Three 6-inch action figures in collector-friendly packaging. You get Batman, Carrie Kelley as Robin, and Mutant Leader! This Batman: Legends of the Dark Knight Action Figure 3-Pack features heroes and a villain from The New Batman Adventures Episode 19 "Legends of the Dark Knight." 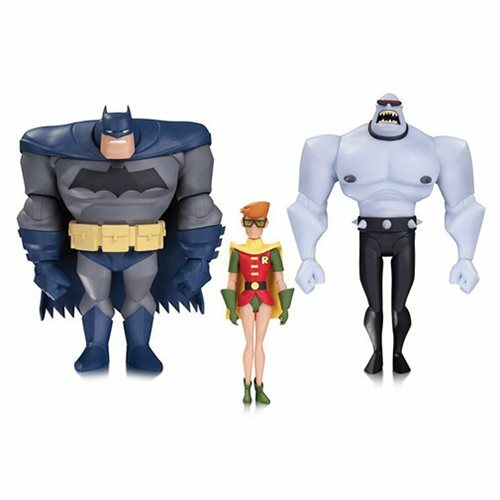 The 3-pack includes Batman, Carrie Kelley as Robin, and Mutant Leader! Batman and Mutant Leader stand about 6-inches tall while Carrie Kelley stands about 5-inches tall. All 3 figures come in collector-friendly packaging. Ages 14 and up.